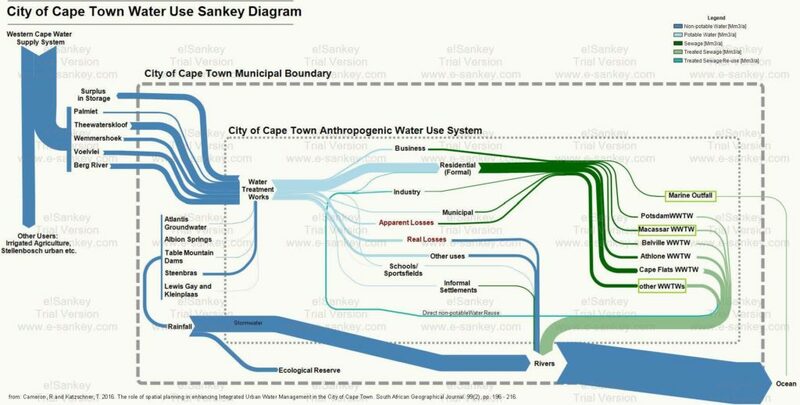 From a post ‘Cape Town’s water crisis : Towards a more water secure future’ on the Future Cape Town blog comes this Sankey diagram on the water use in the city of Cape Town (South Africa). The author of the diagram, Rebecca Cameron, is with MCA Urban and Environmental Planners and looks at how Cape Town could transition towards a more water secure future. This Sankey diagram was originally published in her article Cameron, R and Katzschner, T. 2016. The role of spatial planning in enhancing Integrated Urban Water Management in the City of Cape Town. South African Geographical Journal. 99(2), pp. 196 – 216. Absolute flow values are not given in this version of the Sankey diagram. Flows are in million cubic metres per year (Mm³/a). Water from five different sources outside the municipality feed the city of Cape Town, as well as five sources within the city. A breakdown of water supplied by the municipal water works is shown. Additional color coding of the arows indicate water quality (dark green = sewage, light green = treated water). From the rivers most of the water goes to the ocean. Through evaporation and precipiation it (hopefully) replenishes the reservoirs again that feed the city (this last part not shown in the diagram). This is from a patent filing EP 0494399 A1 on “Process to direct and treat production waters in a paper factory with installation for treatment of waste paper” by German inventor Wilhelm Menges. The diagram is for a paper recycling process. The “thickening filtrate arising from the dispersion of waste paper is directly fed to a biological waste water” treatment. This reduces the COD levels. Flow quantities are shown in printed numbers. A lot of hand-written numbers refer to process elements. The above diagram does not show any unit, but presumably is meant to be in cubic metres (per year?). It shows water (blue) and waste water (grey) flows, as well as evaporation losses (red). More water Sankey diagrams of similar style can be found on pages 19 through 23 in this workshop presentation on ‘The Importance of and Difficulties in Water Accounting’. After writing about VisioGuy’s radial Sankey diagram idea, I went through my bookmarks and collection of Sankey diagrams in search of further candidates for this special class of circular flow graphs. Below is a black/white Sankey diagram of energy fluxes in a chemical loop combustion cycle from an Imperial College website. It is similar to the radial one Chris designed, however it is not exactly circular. Not all of the entries and exits of the cycle are shown as Sankey arrows. The exit of the arrow labeled W is to the center (would one call this anticentrifugal?). The methane input makes a U-turn before entering the loop. The other Sankey diagram is from this website of a U.K. based company, and shows greywater recycling. The average consumption of freshwater per person / per day in the UK was 130 litres in 1996. 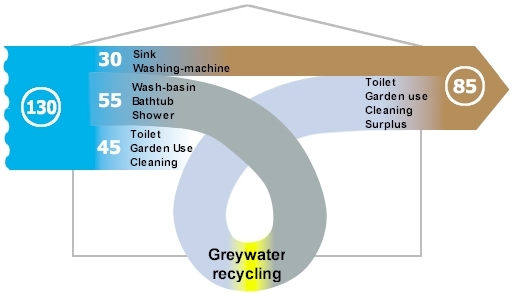 The water from wash-basins, shower and bathtub could go through a recycling stage and be reused for flushing and watering the garden. The designer gave it a roller coaster style loop, which sure doesn’t add to the information content of the graphic, but immediately draws the reader’s attention to the recycling. I am not sure where the third flow coming from the right goes to. 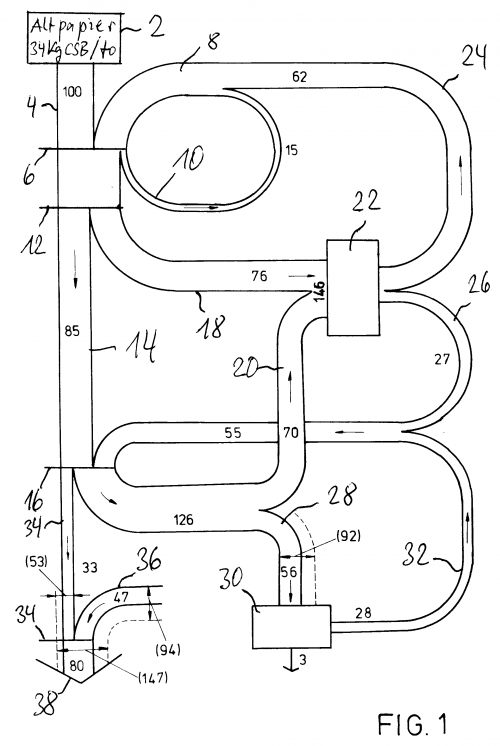 It represents the potential savings of 45 litres/day, but kind of disappears behind the loop. I’ll post more of these as I come across them. Austrian consulting company Stenum has revamped their Sankey Editor 2008 website a little bit, and they added new sample Sankey diagrams. The ones shown below are for the water flows of an electro-plating factory before and after optimization. 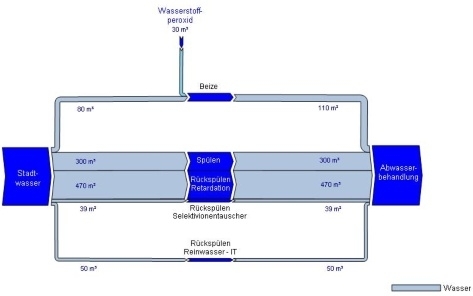 The diagram is in German, but I can understand as much as this: All flows are in cubic metres. Apart from the hydrogen peroxide flow entering from the top the flows shown all run from the source (water supply) to the sink (waste water treatment), the nodes in the middle (flushing, backflushing?) are the actual breakdown of the water flows. These nodes are adapted to the arrow width – a nice feature. On top of that, blue seems the right choice for both water and H2O2 flows. 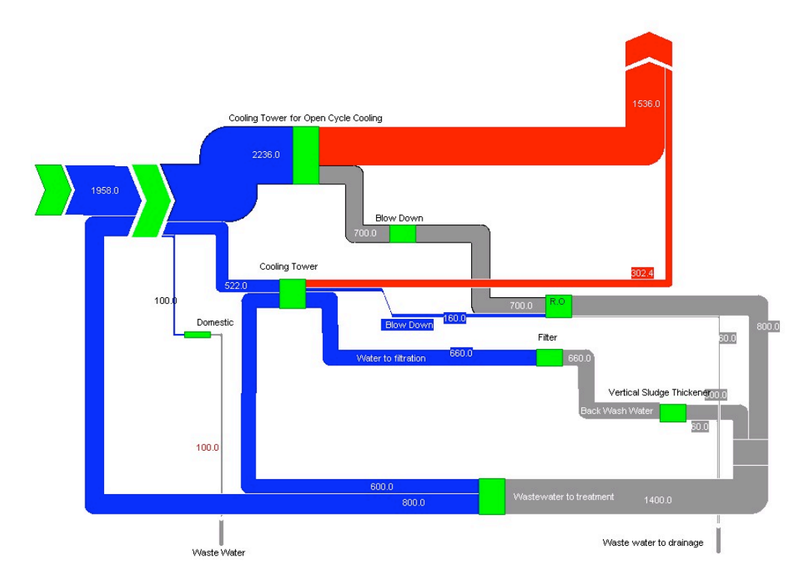 In the Wiki of the CD4WC (Cost Effective Development of Urban Wastewater Systems for Water Directive Compliance) project, I found an interesting Sankey diagram that I wanted to share with you. The waste water treatment process system is shown with a schematic flow diagram. 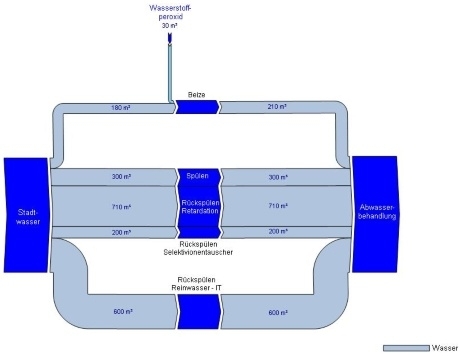 For individual substances that can be found in the waste water, the diagram is then displayed with Sankey flows, that represent the quantity. Thus, Sankey diagrams are a possibility for the “determination of fluxes of substances per unit of time”. This presentation is part of a method is coined Substance Flow Analysis. This presentation is very advantageous: The nodes in the system (the process blocks) remain at the same position, only the magnitude of the arrows changes, when switching to the substance flows view. Flows with large quantities substances are clearly visible. It would also be a possibility to introduce as a third view (next to absolute water quantity, and substance quantities) the substance concentrations (impurities per m³ of waste water).